Facilities include a gift shop, restaurant, dive shop, toilets and baby-changing areas, dive shop, and free car park. The Blue Planet Aquarium is located in Ellesmere Port, off Junction 10 of the M53 motorway and next to Cheshire Oaks. For opening times, news, and admission prices visit the official website. Map showing location of Blue Planet Aquarium. 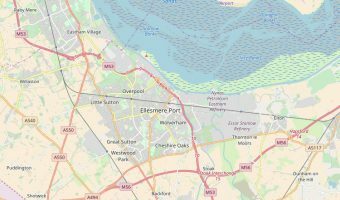 Interactive map of Ellesmere Port. Shows the precise location of hotels, tourist attractions, and other points of interest. 5-day weather forecast for Ellesmere Port. View temperature, wind speed and chance of rain. Designer outlet with over 130 stores and a good selection of places to eat and drink.